Most marketing takes inspiration from somewhere else and when it comes to tackling the more difficult B2B market, there are some valuable retail lessons that could help. In recent years, the retail industry has been under fire because of declining sales. The thing is, the decrease in foot traffic has led to a surge in online traffic. The biggest advantage of online shopping is that you can pick and choose items from the comfort of your own home and have them delivered straight to your door. This option seems especially appealing when you consider how hectic Black Friday is supposed to be in a brick-and-mortar setting, with people stampeding into storefronts as soon as 12:00 am hits. What about B2B? How has B2B been faring recently? In this article, we’ll talk about that and uncover 6 important marketing lessons B2B marketing can learn from consumer retail. This past Black Friday, Old Navy decided to ring in the holiday season with its “One Dolla Holla” cozy socks deal. Although there was a purchase limit of 10 items per person, this deal was enough to remind shoppers that some of the best Black Friday deals are found in-store and not online. Throughout Old Navy’s ads, they were sure to mention that this crazy discount was only available in store. But they didn’t stop there—Old Navy also decided that they would give $1 for every pair sold to The Boys and Girls Club, which provides after-school services for children across the United States. This amazing deal paired with an amazing cause made for amazing savings (and sales)! Social issues have come to the forefront of branding, with more than-two thirds of consumers asking brands to take a stance on current issues because they want to feel a deeper connection for what brands stand for. Just look at what happened when Nike chose Colin Kaepernick for their 30th anniversary “Just Do It” campaign, which made $163.5 million in buzz. This example shows how marketing and sales go well together in any business. When it comes to B2B brands, choosing to collaborate with a non-profit organization or charity can also help build relationships among top executives the same way it can with your target consumer. This lesson is a win-win-win situation. While purchasing products online is one of the biggest benefits of eCommerce, customers still want the option of being able to get their goods now. According to Adobe, “buy online and pick-up in-store purchases” were up 73% this past Black Friday. This one-two combo will be one of the top digital marketing trends for 2019 because it provides users with the convenience they want and need in their shopping experience. For B2B businesses, you can use this same method when it comes to your clients asking for consultations or meetings: have them choose and coordinate their scheduling online to reserve their spot for when they meet up with you in-person. This is one of the best marketing lessons to learn because your online presence is complimenting your physical one. Just like brands that promote their physical shop on their online store, remember to promote your online presence in your physical location(s) as well. This past Black Friday/Cyber Monday weekend was exceptional for online businesses. Cyber Monday officially became “the highest U.S. ecommerce sales day in history with $7.9 billion in revenue.” While this statistic may come as no surprise, it might be surprising to discover that 54% of consumers preferred multichannel shopping methods, which means that they chose to do their shopping both online and in-store to get the best deals. For B2B brands, after a meeting or a corporate lunch, don’t forget to mention your digital presence. Highlight your LinkedIn profile or website on your business card and even ask for your client’s personal social media handles. It’s all about strengthening your relationships and expanding your network. Everyone could use a good laugh. 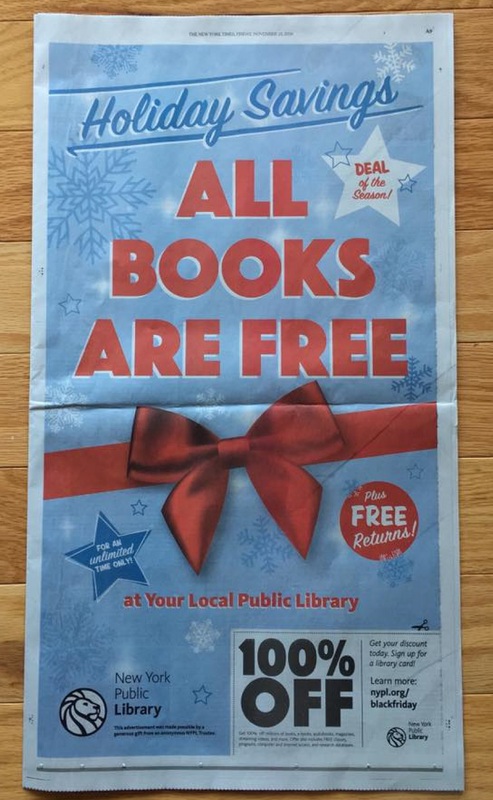 For this past Black Friday, the New York Public Library decided to remind everyone in an advertisement run in the New York Times that all their books will be free. (Get it? Because it’s the New York Public Library, all books are free anyway!) In the ad, they wrote, “100% OFF, get your discount today! Sign up for a free library card.” Needless to say, it got some giggles. Humor is probably one of the most underrated marketing tactics because, if done incorrectly, the jokes can be seen as cheap. However, if your team plans ahead and comes up with a clever spin on something, it can be received really well like this advertisement by the NYPL. One crucial element the NYPL added to this specific campaign was that they reminded consumers of their uniqueness. In your next B2B marketing campaign, use humor to not only give your clients a laugh, but also to remind them why your business is unique and different from the rest. B2B, it’s time to go mobile. For instance, Black Friday sales jumped 23.6% last year, and of the $6.2 billion online sales that were made, $2 billion of that revenue came from smartphones, with 33.5% of total sales. One of the biggest reasons customers decide to shop on mobile devices is because of how easily accessible content is from the palm of their hand. With users spending around four hours a day on their phones, it’s quite likely your brand could receive a fraction of that face time. In fact, 67% of mobile users say they’re more likely to buy a site's products or services if they visit the mobile version. While the option to go mobile may not be for every B2B business, it’s still an avenue worth exploring because it can help with your business’ SEO efforts. Additionally, Google’s index is mobile-first, which means you will rank lower if you don’t have a mobile friendly website. Apart from SEO and UX, having an easily accessible site through mobile means you will also be more available to your clients, current or potential. The real importance of market segmentation comes into play when brands are trying to build loyalty with their users. When it comes to B2C marketing efforts, one of the best ways brands get users to come back is through segmentation. This means that brands will send content to specific users based on a number of different criteria, such as previously viewed items and purchase history. As a B2B brand, you can also segment your clients based on what interests they have in your products and services. This way, you can offer more specialized solutions to their business. After in-person meetings, remember to connect with your clients online! Segment your clients into different audiences to deliver more specialized solutions to their business. Author: Therese Palmere is a content writer and content marketing plan consultant for Aumcore, a digital marketing agency that specializes in SEO and all things digital. She dabbles in social media marketing and writes about everything, from eCommerce web development to emerging marketing trends.